I’m a sucker for biscuits. So when I see a biscuit recipe, I’m inclined to want to try it. Sometimes I’m happy with the results. Sometimes, I’m not. But by and large, I’ve never met a biscuit I didn’t like. Most recently, I gave Deb’s Cream Biscuits a go. I’d like to tell you that I fell in love with these cream biscuits. But I didn’t. Maybe it was an off day in the kitchen. Maybe my ingredients weren’t as fresh as they could have been. Or maybe the Universe was telling me not to fall in love with these biscuits because it knew that there’s a heavenly looking biscuit recipe in my copy of Cook Wise. But just because these particular biscuits and I didn’t make a Love Connection, that doesn’t mean that you won’t. Click on that link up there to hop over to Smitten Kitchen. Who knows, maybe it will be love at first bite. I am stuck on Martha Stewarts Angel Biscuits…they have yeast in them, so it’s a bit of a cheat…they always rise and are flaky too! Kristen, I saw that recipe recently and the thought of yeast made me run away. I used to make a lot of biscuits, but recently I’ve stuck on Parker House Rolls from the King Arthur Flour website. I LOVE them! And I even did a wheat adaptation (I’ll blog about it someday, I promise!) that rocks too. It does have yeast, but is SO WORTH IT! As far as biscuits go, I think they might be the one thing I know how to make from instinct, from hanging out so much with my southern grandmother as a kid. According to the scale, I need to lay off the biscuits. And the cinnamon rolls. And everything else I’ve been getting into lately. This does not bode well for my Bread Bible studies and facing my yeast phobia. Yeast scares me too. As do biscuits. But after I saw one of those bozos on Worst Cooks in America make them successfully, I feel the need to try some myself. But maybe not Deb’s Cream Biscuits, huh? Kathy, these cream biscuits wouldn’t be the first ones I’d recommend. 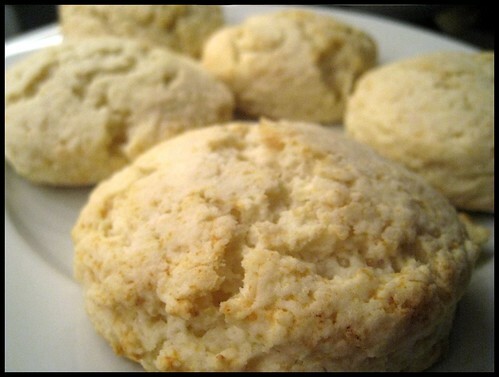 Right now I’m kind of stuck on some cheesy drop biscuits that will post Feb 8th. And my sweet potato biscuits https://bonappetithon.com/2009/09/23/got-biscuits/. Oh, now I’m eager to watch the WCA episode from Sunday. Our power was out all day yesterday so I’m a day behind on my Tivo schedule. I’m also suffering from empty fridge syndrome after having to throw all the perishables away this morning. What’s worse about the scale was going to the doctor last week and being able to figure how much mine is off. But I like the idea of blaming it all on winter instead of admitting it has anything to do with Scooby Snacks, Cinnamon Rolls, or my lack of gym time.